The PowerBeacon is the largest, brightest and most versatile hand held beacon made with special features to increase its usefulness to its user. The flashing picture at the right shows a diver with his yellow PowerBeacon flashing. He is holding the beacon in his right hand. It consists of two main parts, the battery and light module and the light wand. It serves as two different pieces of equipment depending on whether or not the light light wand is installed. The light wand may be installed and removed under water. 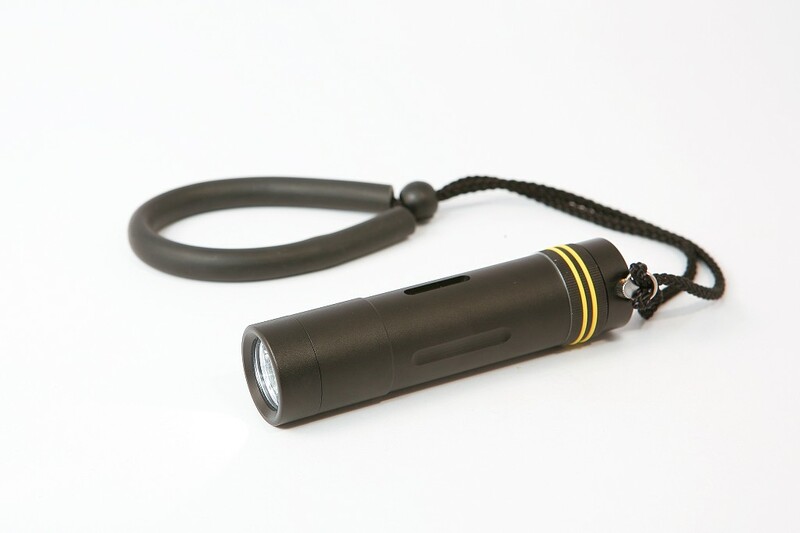 Without the light wand, it serves as a flashlight that will help prevent diminishing your night vision. The powerful LED lights are deeply recessed into the light socket. The switch allows you to select either steady on or flashing if you want to use it as a signal. Total length is 11 inches. Light wand length is 6 inches. The PowerBeacon comes in your choice of colors, red, green, yellow or white. With the light wand inserted, the PowerBeacon can be seen in all directions. 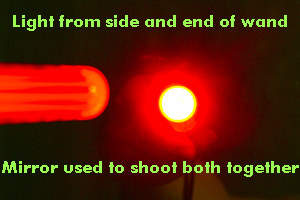 If you want to attract a specific individual you can point the end of the light wand in their direction and it will put out a beam of light that is 250 times brighter than the side of the beacon. So, for example, if you were using it to attract rescuers at night you would have the light wand to be seen, but if you see a plane or boat that hasn't spotted you yet, you would point the beam at them to increase the intensity. If you are directing traffic, and need to get the attention of one specific car, just point it at him. The model shown below is the white light model. 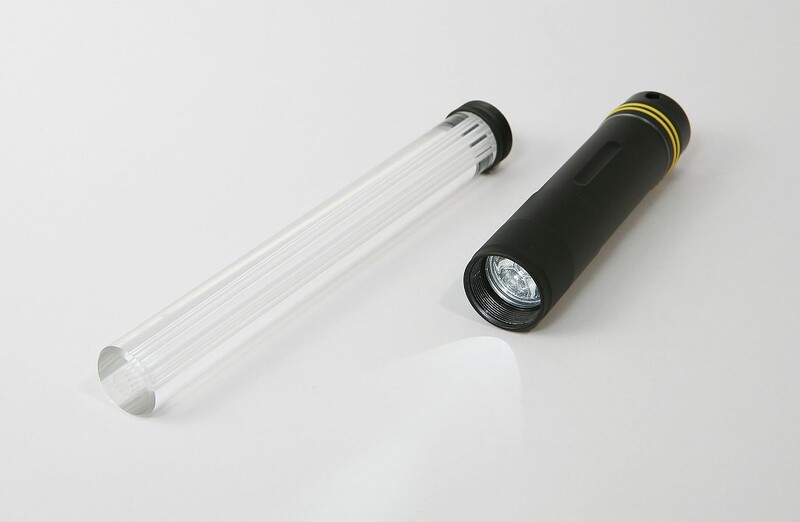 It can be used as a regular back-up flashlight, bright enough to get you back if your main light fails, or a good light to use just to check out holes to see what's down there. With the light wand in place, you can use the wrist strap to suspend it down into an area. It will light up the entire area. Note: all of the colors are bright enough to use as a back-up light. The colors will also help protect your night vision. Mark your entrance and exit point, signal your students or assistants, suspend it beneath a boat to guide the divers back to a green light or summon them back to a red light. Use the steady beam for normal signal or the flashing beam to note an emergency. Leave it at your dive site to guide you or other divers back to the location. Hang it on your BCD so your dive team can follow you. Use it as emergency running lights on your boat, hang it on your back or bike at night. It uses three AAA batteries, regular or rechargeable, to give you 2 hours of steady light or 24 hours of flashing. Completely impervious to water. Designed to be used by SCUBA divers. The PowerBeacon will make all those other little signal lights look like toys. This was designed as a solid state unit for use by military, police, fire rescue and professional divers. But that doesn't mean that a sport diver or instructor shouldn't take advantage of it. What good is a signal marker if people don't notice it? No dive boat, instructor, team leader or dive master should be without one.